Ask Leo! #692 – Hard Disk Failure Is Imminent! What Do I Do? What to do when your hard drive is nice enough to tell you it's dying. Also this week: viewing BCC'ed recipients (spoiler: you can't), as well as signs that your Facebook account is being hacked -- or not. This week was also the one year anniversary of one of my non-tech projects: Not All News Is Bad. Come join me if it seems like there's nothing but gloom and doom these days. Another spoiler: not all news is bad. Really. I get a message that shows hard disk failure is imminent, please back up your hard disk and have it replaced. So I did the backup with the system built in backup process. But it stopped the process halfway. So some files were encrypted and some files were not. I copied the files which were not encrypted to my external hard disk drive. But the remaining files which were encrypted are not able to copy and open. Please give me an idea to recover my files. I'm sorry to say it's very possible that you are S.O.L. : Severely Out of Luck. I'll run down what I suspect is happening, what I would do in your situation, and additional options you might have. And, of course, I'll review how you could have prevented this in the first place. Honestly, you're lucky you got a warning at all. More commonly, drives simply fail in some fashion without notice. There is no guarantee you'll be warned. All that means is that you need to take this message very seriously as soon as you see it. I'm going to assume you're reaching out for data recovery help because there's important data on that drive that isn't backed up elsewhere. I'll talk more about that in a moment, but for now our focus is on getting what we can off the drive. The fact that some of the files are encrypted complicates matters. With unencrypted files, partial recovery can still be valuable. Encrypted files, on the other hand, are often all or nothing. In addition, when Windows' built-in encryption is used, it really needs to be your copy of Windows that decrypts the file. That means moving the drive to another system and seeing what tools you can run or what data you can recover is less likely to be effective. In a situation like this, where preserving and recovering the contents of an entire hard drive is the goal, my mind turns to SpinRite. In your shoes, I would see if I could get SpinRite to run on this hard drive and possibly recover the contents of the damaged sectors. SpinRite hasn't been updated in ages, but it's apparently still working well. You'll need to be able to boot from SpinRite's CD image. Depending on the size of and damage to your drive, SpinRite can take a very long time. There's no guarantee your data will be recovered. But that's where I'd go first. If SpinRite can't do the trick or it's simply too intimidating (it is kinda geeky), your options are few. If the data on the hard drive is important enough — meaning it's worth money to you — your next option would be a data recovery service. I say “worth money” because that's exactly what it's going to take to have such a service examine the disk and do what they can. It can be very expensive. And once again, there's no guarantee your data will be recovered. Perhaps it's worth it, depending on what you're about to lose otherwise. I have no recommendations, as it's never been worth it me. It's never been necessary, and you can probably guess why. Hard drives fail all the time. They just do. Oh, you can go for years without experiencing it, but then suddenly you see “Hard disk failure is imminent”, or worse. You must prepare, and preparation is simple: back up. If you'd had a backup of your data taken prior to the hard drive's imminent failure, you would simply replace the drive, recover the data from backup, and get on with your life. It would be that simple. 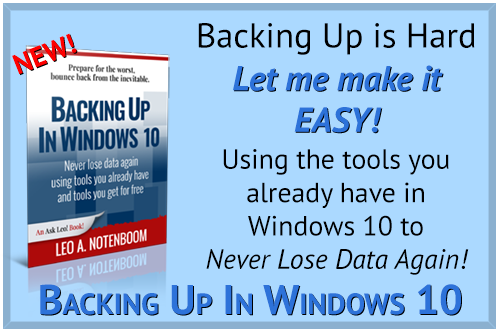 I have lots of different articles on how to back up — the links below only touch the tip of the iceberg. It's something I preach about and write about often, specifically because of stories like yours. And that just doesn't have to be. Whether or not you get your data back, please, please learn from this experience and begin backing up right now. Related Links & Comments: Hard Disk Failure Is Imminent! What Do I Do? How Do I View the List of BCC'ed Recipients on an Email I've Received? I want to find the list of “undisclosed recipients” of the email I've received. Is there a way? “Undisclosed recipients” is often placed in the “To:” line by email programs when the message being sent has no entries in the “To:” or “Cc:” lines. The sender has used the “Bcc:” feature of email to send the email to one or more people without revealing who they are. So, how do you find out who they are? Continue Reading: How Do I View the List of BCC'ed Recipients on an Email I've Received? I received this message: “We received a request to reset your Facebook password.” (to two different e-dresses) at 2:30 something am. I was not up at that hour. The links in the email, I believe, lead to an actual FB page to reset my password. Does this mean that someone was trying to hack me? All I can really say is maybe. I might even go so far as to say probably, but I can't say yes, since there are other possible explanations. Let's review what's going on. Continue Reading: Is Someone Trying to Hack My Facebook Account? « Previous post: Ask Leo! #691 – Is Online Banking Safe?